My name is Matt Winick from Ann Arbor, Michigan with a strong interest in learning history including public policy with social justice. In these main subjects, I like to learn the need to make Civil Rights stronger to reduce discrimination, protect the environment from pollution, find ways to improve social justice to make society better, and many others. 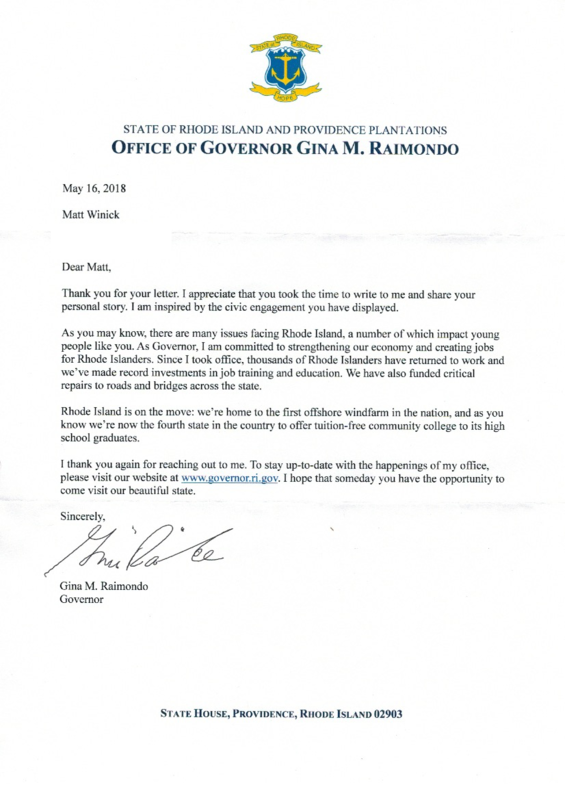 Governor Raimondo, the main reason I’m writing you a letter is to explain how I find your role as 75th Governor of Rhode Island to be very inspiring to me. In 2015, I was amazed on how you made history by becoming the first female to become Governor of Rhode Island after you won the Governor 2014 election. In your current role as Governor of Rhode Island, I am very proud on how you are a strong supporter of making Civil Rights stronger to protect minorities, women, and people with disabilities from being discriminated in education including public places. Also in Civil Rights, I like on how you advocate for people with disabilities’ rights, express the need for equal pay for women to help protect them from being discriminated in a work place, push for funds to help assist women including minorities to help them compete in the economy, and support LGBT rights. Your approach on improving the economy like working with different companies to help hire women including minorities and people with disabilities to work for them, pushing for job-training programs to help train workers including youth to develop job-skills to help prepare them for the workforce, expressing the need to improve worker’s rights, and implementing two executive orders which is to create Diversity in Construction Working Group including a new commission to help advice Office of Diversity Equity and Opportunity to help find ways to help provide funds or state contracts to businesses that are owned by minorities, women, and people with disabilities are common sense. On education, I like on how you expanded funds for special education to help students with a disabilities get educational resources to help provide accommodations, pushed to early childhood education to help young children to develop learning skills, and provide after school programs to help students get help on their assignments or have volunteer programs to help them be part of the community. Another thing that I like about your work on education is how you are pushing with expressing the need for two year of free tuition at state’s public colleges including community colleges to help students who want a higher education afford a college when both political parties aren’t advocates for these values. To protect the environment, I am very proud on how you are pushing for clean energy jobs by providing tax credits to industries that create clean energy technology, supporting renewable energy sources to help reduce addiction to oil with gas, and providing funds to clean up parks including water resources to make them safe for people to use. Also what I like about your role as Governor of Rhode Island is how you are working hard to improve tourism by pushing for funds to help restore or preserve historical sites or museums to help make learning a better place, expanding on programs to help clean up state parks along with beaches to help make tourism safe while protect natural resources, and work on creating an initiative to help train people to work in the tourism industry. Governor Raimondo, I have autism with a learning disability. Having a disability is hard for me because I have trouble comprehending on learning different subjects, sometimes I struggle to communicate my thoughts, and get teased. Your commitment to be a strong supporter of Civil Rights and your advocacy for people with disabilities’ rights really inspires me to work hard on my disability. Another thing is your work on improving tourism along with restoring historical sites including museums motivates me to continue my interest in learning history. Also you commitment to work hard on finding ways to improve social justice gives me a strong interest to learn the importance of diversity, the need to improve worker’s rights, improve education reform, and many others by watching documentaries that focus on these topics. My letter is a gift to you for inspiring me and for Women’s History Month to recognize women who work hard to make a great difference. Again congrats on making history by becoming the first woman to become Governor of Rhode Island and you should be proud of it. I strongly believe that you are making a great difference in your current role. You have inspired me to work hard on my disability, continue to learn history, and have an interest to learn the need to make social justice a better place. Thanks for taking the time to read my letter, working hard to make a great difference when there are obstacles, and inspiring me. I wish you and Mr. Andrew Kind Mofit to continue to make a great impact on society.